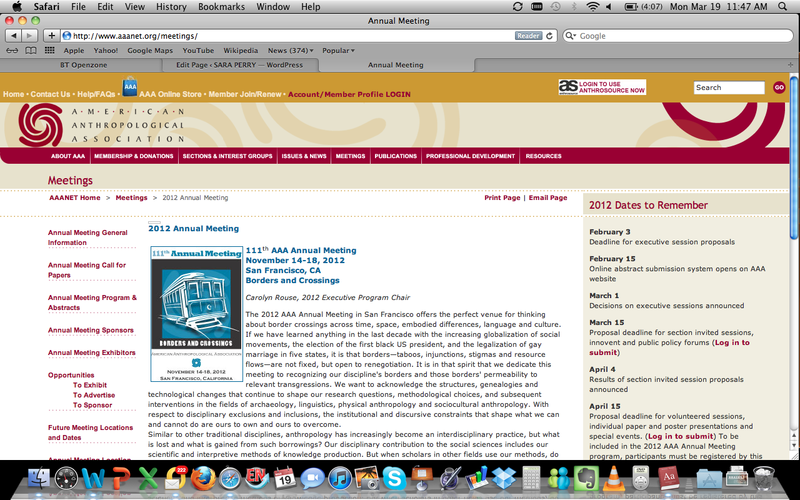 Screenshot by me of the American Anthropological Associations webpage for the 2012 meetings in San Francisco, 14-18 November. The time has come again to recruit contributions to our annual roundtable discussion on visual ethics at the American Anthropological Association meetings. The deadline to express interest in participating is very soon – 5 April – so please get in touch with me if you’re keen to present on your ethical negotiations with imagery. My contact details are available via my York webpages. This roundtable discussion, organised on behalf of the Society for Visual Anthropology’s (SVA) Ethics Committee, seeks to continue the SVA’s now six-year-old tradition of nurturing debate and critical reflection on the ethics of anthropological imaging. Building on this year’s conference theme of “Borders and Crossings,” we aim to probe anthropologists’ ethical negotiations with image creation, circulation and consumption within and across disciplinary boundaries. Of particular interest is the iterative and unstable nature of image use—the navigation of visual value systems and moralities across time, space, cultural and institutional context, particularly when circumscribed by programmatic ethical review models. How have histories of anthropological, scientific and related social scientific practice impacted on our contemporary management of imagery? Where is representational authority situated in unstable, multiply-occupied/authored anthropological contexts? How are shifting visual technologies and intellectual paradigms disrupting or rearranging our ethical priorities? How do we anticipate and negotiate future relations with pictorial materials? And what legacies are our current approaches to image ethics likely to leave behind? For those interested in participating, please provide a brief description (max. 150 words) of the particular scenario or issue you wish to contribute to this year’s discussion as soon as possible, and by 5 April at the latest. Decisions will be made by 10 April, and contributors will need to register for the conference via the AAA’s web-based system by 15 April. All correspondence should be sent to Sara Perry. The roundtable will take the form of a series of brief, 10-minute presentations by participants, culminating in an extended period of group discussion and debate. Please note: As per AAA participation rules, presenting as part of a roundtable counts as a person’s one “major” role, the same as giving a paper or poster.